When newlywed Ava Whalen follows her husband to his family home on St. Simons Island, she discovers a tangled web of dangerous secrets in this enthralling story from the New York Times bestselling author of the Tradd Street novels. For as long as she can remember, Ava Whalen has struggled with a sense of not belonging, and now, at thirty-four, she still feels stymied by her family. Then she meets child psychologist Matthew Frazier, and thinks her days of loneliness are behind her. After a whirlwind romance, they impulsively elope, and Ava moves to Matthew’s ancestral home on St. Simons Island off the coast of Georgia. But after the initial excitement, Ava is surprised to discover that true happiness continues to elude her. There is much she doesn’t know about Matthew, including the mysterious circumstances surrounding his first wife’s death. And her new home seems to hold as many mysteries and secrets as her new husband. 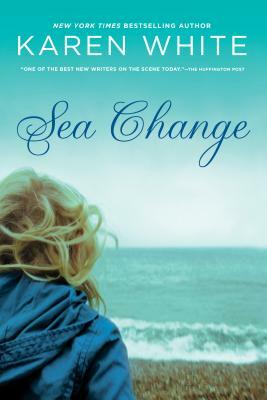 Feeling adrift, Ava throws herself into uncovering Matthew’s family history and that of the island, not realizing that she has a connection of her own to this place—or that her obsession with the past could very well destroy her future. Karen White is the New York Times bestselling author of more than twenty novels, including the Tradd Street series, The Night the Lights Went Out, Flight Patterns, The Sound of Glass, A Long Time Gone, and The Time Between. She is the coauthor of The Forgotton Room with New York Times bestselling authors Beatriz Williams and Lauren Willig. She grew up in London but now lives with her husband and two children near Atlanta, Georgia. Have you read any of the author’s previous works before? If so, did you enjoy the more supernatural elements blended into White’s story? The spray of the sea, the rich musky air of a roots cellar, the persistent kudzu vines. White conjures up a strong, vibrant sense of place for the reader for life on St. Simons Island. Did you feel like you were transported there (and even into the past) while reading the story? What other descriptions sang out to you? How do the multiple voices in the book come together to tell one story? Do you think the story would be as layered or successful without one of the voices, like Pamela’s? Do you think Ava does the right thing by attempting to dig up the truth behind Adrienne’s final days? Could you have lived with so many secrets or rooms closed off to you? Did you think Matthew was guilty of her murder? Do you think objects, like Pamela’s wedding ring, can carry powerful energies that connect us to the past? If so, how? Are there beloved items in your own collection that might have a similar kind of special energy? What are they? Why do you think John allows Adrienne’s family to think the worst of him after her death? Do you think he goes too far—especially as his actions become more secretive and troubling to Ava—in trying to protect her legacy? Describe the relationship between Pamela and Georgina. Do you think all relationships between sisters are as emotionally complex—or perhaps complex in other ways? How so? Do you think it was ethical for John to hypnotize both his wives, even if the intentions were to be helpful or unlock their connections to their ancestors? What are the dangers of opening up these psychological doors that have remained closed for so long? What were the results for the two women? A lifelong collector of undeveloped photograph film (from yard sales and other places), what do you think is behind Ava’s attraction to those images, once printed, that feature sisters? Do you think it’s true that "being a mother is like being a gardener of souls"? How is that true for the women in the book? How might it be true in your own life if you yourself are a parent? Do you see this as your role, and how do you nurture your little "seedlings"? Were you shocked by the revelation of Ava’s biological parents? Do you think it was best for Gloria and Mimi to keep her in the dark for so long? What are Jimmy’s feelings? Do you believe in the possibility of reincarnation? Why or why not? Do you think Geoffrey and Pamela are finally together?